Once again I could read that book courtesy of the Author, Zoe Saadia, who very generously sent me a copy in return for an honest review – thank you very much! Coyotl and Kuini continue their adventures. Now they are both older, more experienced young men and their roles changed as well. Coyotl, previously the Honourable First Son a.k.a Heir Apparent of a local kingdom, now, after the death of his father, is just another Acolhua fugitive, depending heavily on the kindness and mercy of the family of his friend, Kuini. He cannot even dream of returning to his homeland, conquered by the Tepanecs, and claiming the throne. With no army, no allies and no political clout, he is a nobody, right? And yet… Tecuani, the Highland Warriors’ Leader and Kuini’s father thinks Coyotl can play an important role in stopping the expansion of the Tepanecs. Still Tecuani seems to be the only one and, with so many enemies around, the days of Coyotl might be counted. Will he manage to find useful allies and return to the throne? Or maybe he’ll perish from the hand of a jealous husband? It is really nice to read a series which becomes better and better. The first installment, The Highlander, reviewed by me not so long ago, was good; Crossing Worlds I liked even more. The world building was richer, the characters – more three-dimensional, there were also much more interesting female characters introduced like the mother of Kuini, Mino, and little Dehe, an outcast girl who was supposed to be a priestess but committed a sacrilege. Yes, this time the criteria of the Bechdel test were met and I was so glad! What’s more the author didn’t forget about some of her female characters from the first part – the cheeky Iso is back, this time as a young wife of a constantly absent warrior who, of course, had to return in the worst possible moment. I admit I really like it when you meet the same characters across a series and can observe their development so it was a delight to see Iso again! Our two main leads, Kuini and Coyotl, are again the main leads but their roles changed greatly. Now it’s Kuini who is more important. He has to protect his family reputation and defend Coyotl, a young man completely vulnerable in a foreign country which language and customs he barely understands. Their friendship will be strained time and again, especially as Kuini will have to face his own demons, being additionally accused of sheltering the sworn enemy of his own people. I think the biggest asset of the author is a knack of bringing history alive, even if it is an obscure period of history, not something greatly featured in your textbooks. How many readers have previously heard about the expansion of Tepanecs in the Mesoamerica? Aztecs or Mayas definitely ring a bell but the Tepanecs? Well, if you start reading this series, you will know far more about them all and you’ll never be bored while learning. Can you think of a greater recommendation of a historical fiction novel? Two installments and I still yearn for more. Bring on the Aztecs now and their Flowery Wars! 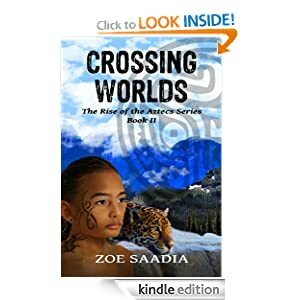 This entry was posted in book review, historical, read in 2013 and tagged Crossing Worlds, series alert, The Rise of the Aztecs, Zoe Saadia. Bookmark the permalink.